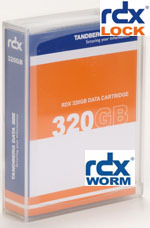 Tandberg Data today announced the worldwide availability of RDX media with WORM (Write Once Read Many) functionality. Combined with RDX WORM media, RDX removable disk systems, including RDX QuikStor and RDX QuikStation, now meet an expanded set of regulatory compliance requirements and are ideal for use with a large number of archiving applications. 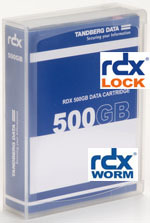 Files stored on RDX WORM media cannot be modified or deleted and can be accessed and read without limitation. Data can be added to RDX WORM and existing files cannot be overwritten. With this new enhancement, RDX becomes the single best technology to replace magneto-optical drives, CDs and DVDs. "Since 2005, RDX technology has been promoted by major system OEMs and trusted by professional IT departments for reliable and affordable backup and disaster recovery," said Hugo Bergmann, product manager at Tandberg Data. 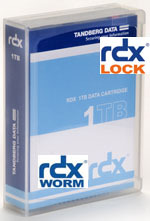 "With the new WORM functionality, RDX now integrates extremely well into a broad range of archiving solutions. In addition, prosumer users can take full advantage of this technology by archiving their music, movies and photos in a safe and undeletable manner."